In a very narrow ruling, the World War I memorial shaped like a Latin cross will continue to stand in the Mojave desert. But this was not the victory that conservatives hoped for, and serves as a reminder that the current Supreme Court is a moderate one. On Wednesday, April 28, the Supreme Court handed down its long-awaited decision in Salazar v. Buono concerning the Mojave cross. A white cross stands atop Sunrise Rock, erected by the Veterans of Foreign Wars (VFW) in 1934, with a plaque dedicating it to those who served and died in World War I. In later years, the land where the cross stands became federal land: the Mojave National Preserve. 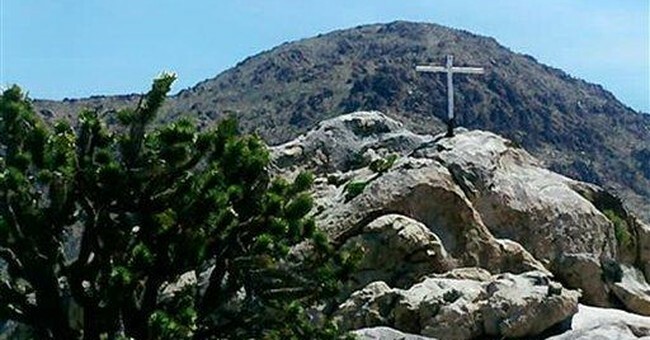 Predictably, someone who was offended that this lonely cross standing in a desert happened to be in a public park decided to sue—with the help of the ACLU. In recent years, a court-ordered the cross torn down, and the Ninth Circuit appeals court affirmed that decision. Then the VFW made a deal with the Bush White House and the Republican-led Congress: The VFW owned land adjacent to the federal park, and would make a land swap, taking the acre with the cross, and donating land of equal value back to the park. Therefore, the memorial cross would now be on private land, and the park would receive equal-value land in return. Everyone could claim victory, and go home. Refusing to take yes for an answer, the plaintiff and the ACLU ran back to court, getting an order stopping the land transfer. They did this to keep the cross on government land, so that it would have to be torn down in a shocking display of blatant hostility to people of faith. Once again, the Ninth Circuit affirmed this order, so finally the Supreme Court took the case, and heard arguments in October. The Court’s decision this week was a partial victory for the cross and the VFW. The Court held by a 5-4 vote that the cross could stay, for now. But the Court’s decision was fractured. The controlling opinion, written by moderate Justice Kennedy, joined by Chief Justice Roberts, held that the plaintiff, Frank Buono, still had legal standing to continue this lawsuit, and then sent the case back to the lower court to determine whether a reasonable person would think the land transfer of giving the cross back to the VFW would look like an endorsement of religion. If the court finds no endorsement of religion, then the land swap will finally occur, and the memorial cross will forever be safe. Justice Alito agreed that Buono had standing to sue, but instead of sending the case back down for another hearing, he would just throw out the lower-court order so that the land swap could take place now. Justice Scalia, joined by Justice Thomas, took the more conservative approach of just arguing that Frank Buono had no standing to continue this lawsuit because the land transfer did not personally injure him in any way, and would throw out the entire case so that the land transfer to go forward immediately. All four liberal justices dissented, voting to keep the lower-court order in place, blocking the land transfer. In so doing, they would require the cross to be physically torn down, resulting in the absolute tragedy of the United States government destroying a cross, which in this case is both a symbol of the Christian faith, and also a monument honoring those who served in World War I, regardless of their faith. Retiring Justice John Paul Stevens argued that allowing the VFW to take possession of this plot of ground with the cross would send a “starkly sectarian message,” and therefore that it is unconstitutional. It is a shocking level of hostility to religious faith to say that the government cannot even allow a private veterans’ organization to take a veterans’ memorial shaped like a cross—that somehow the Constitution commands the memorial’s destruction. Yet both Justice Ginsburg and Justice Sotomayor joined this dissent. What’s so interesting here is that President Obama’s sole Supreme Court appointment to date, Sonia Sotomayor, signed on to Stevens’ dissent, not Breyer’s. So in addition to voting to compel the government to destroy a cross, she went with the more liberal track of arguing that even war memorials in the desert are unconstitutional if they happen to look like a Christian symbol. This raises a serious concern for the upcoming Supreme Court confirmation, in terms of the type of people President Obama seeks to put on the Court. Adding one point as an attorney, I wrote a brief in this case on behalf of the American Civil Rights Union (ACRU, not ACLU), arguing that this case should be thrown out because Buono lacked standing. The Scalia-Thomas approach here is the best approach. It would have drawn a line for future cases, that people in situations such as this don’t have standing to run to a federal court to ask a judge to order the destruction of symbols such as the Mojave cross. Further, it would create a rule that, even if such an order is given, then if the White House and Congress can later find a solution that eliminates the “injury” that religious symbols allegedly inflict on militant leftists, that courts have no business trying to block these reasonable measures by transforming the government into a wrecking ball to demolish Christian crosses. So Salazar v. Buono was a missed opportunity for those who support religious freedom. But the silver lining is that at the end of this process, the Mojave cross should continue to stand as a silent memorial, erected in reverent honor to those who fought in far-off lands to protect the United States and our constitutional freedoms—including the freedom of religion.